It's pretty much a once in a lifetime event when international cycle race, the Tour De France (clue's in the name), whizzes through your little town in West Yorkshire so when it does it's appropriate to mark the occasion properly. Our friends who were coming to celebrate with us are rather sporty (Iron Man, anyone?) so as road closures were in place they decided to cycle the tough 21 miles over to us the day before. 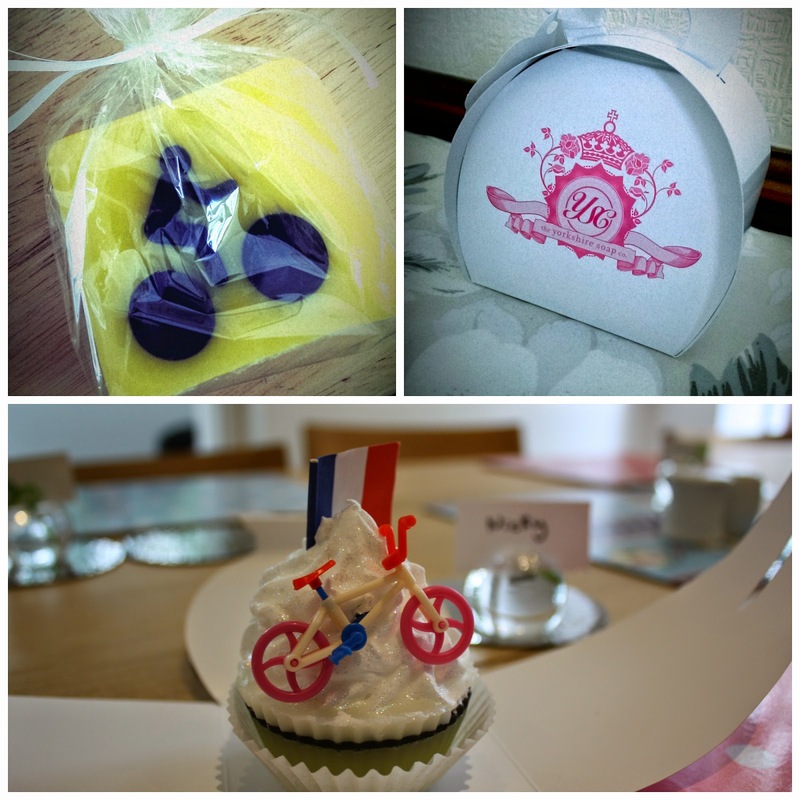 I like to think that I can give Monica Geller a run for her money in the hosting stakes and I think that chocolates on guests' pillows are always a cute kitsch touch, but when I walked past The Yorkshire Soap Company earlier in the day I decided to get these Tour De France themed soaps instead. 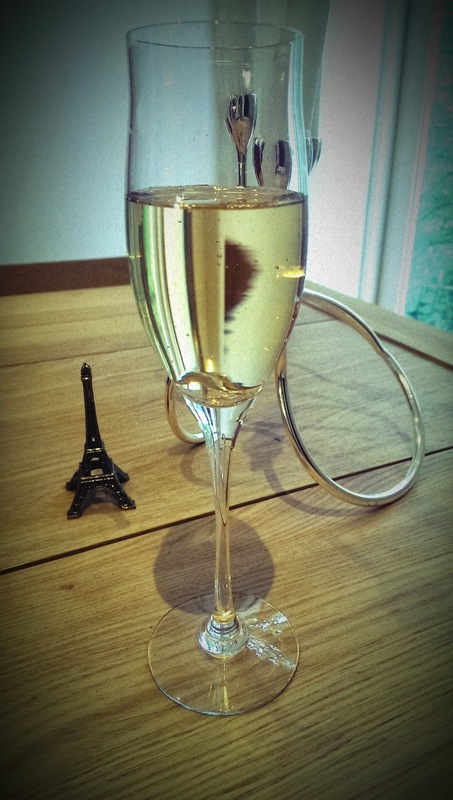 After bubble baths and a quick change, we got the party started with some champagne (what else?). 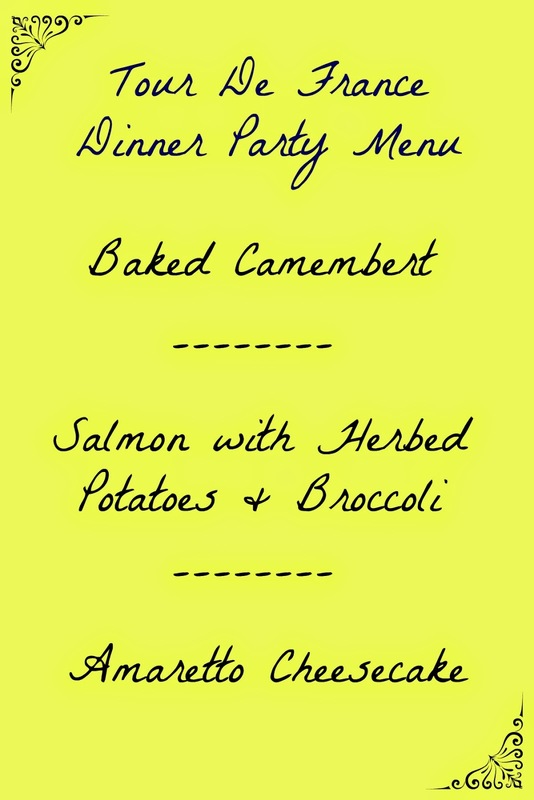 I love cooking and trying out new recipes, however when you're entertaining I think it's best to stick with what you know and (I know it's a cliché) to serve something that you can prepare ahead of time (how many dinner parties on Come Dine With Me are ruined by people trying things out for the first time and by making their guests wait until 10pm to get their main course?!). 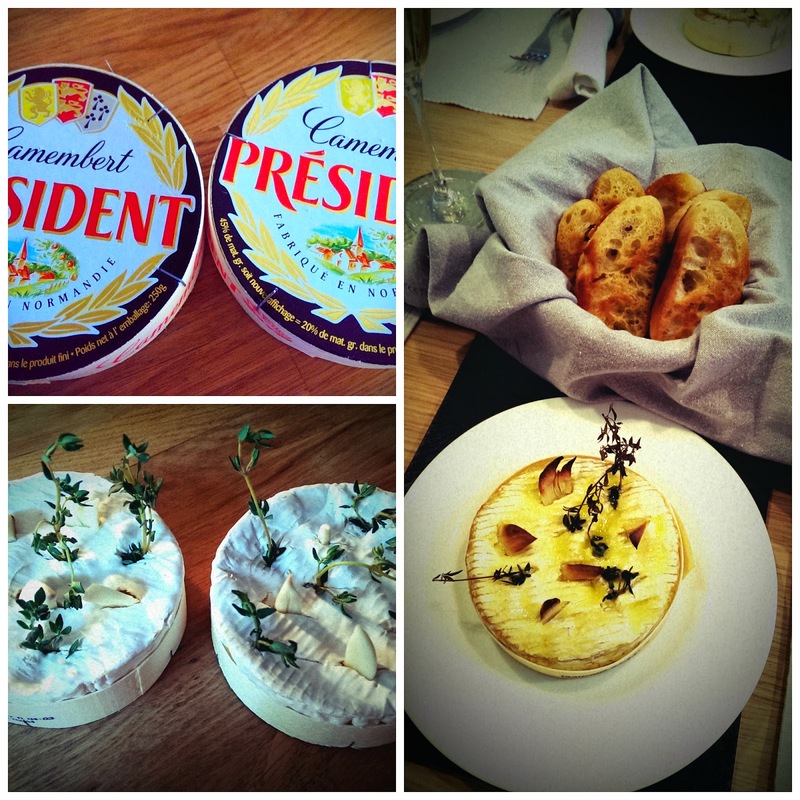 The Camembert was super-easy to prepare (see recipe here) and I toasted bread drizzled in olive oil on the griddle whilst the cheese was in the oven. 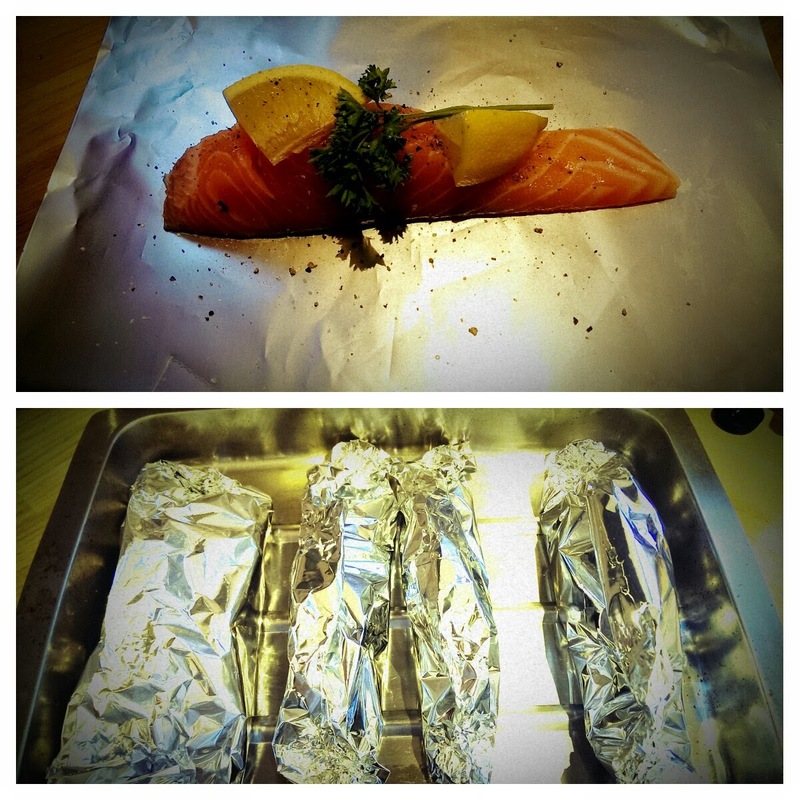 The salmon, which was wrapped in foil with seasoning, lemon and parsley, and the potatoes cooked while we were eating our starter - all I had to do to serve was pop some tenderstem broccoli in the steamer and tumble the potatoes in some melted butter and sprinkle them with chopped fresh herbs. I also made a quick sauce to go with the salmon. Empty a small tub of crème fraîche into a smallish saucepan with the juice and zest of half a lemon and season well. I usually also chop a bunch of fresh parsley or chives into the sauce but as the potatoes were herbed I decided not to on this occasion. 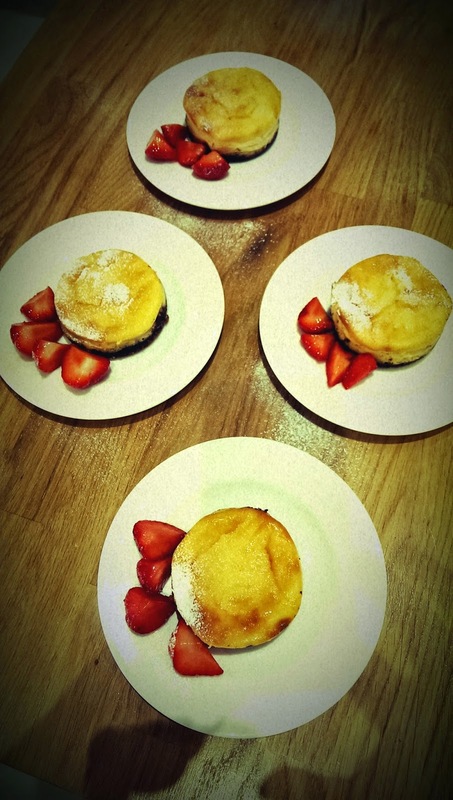 The recipe for the amaretto cheesecake (here) actually forces you to make it the night before, so all I had to do was take them out of the fridge and add a couple of strawberries! 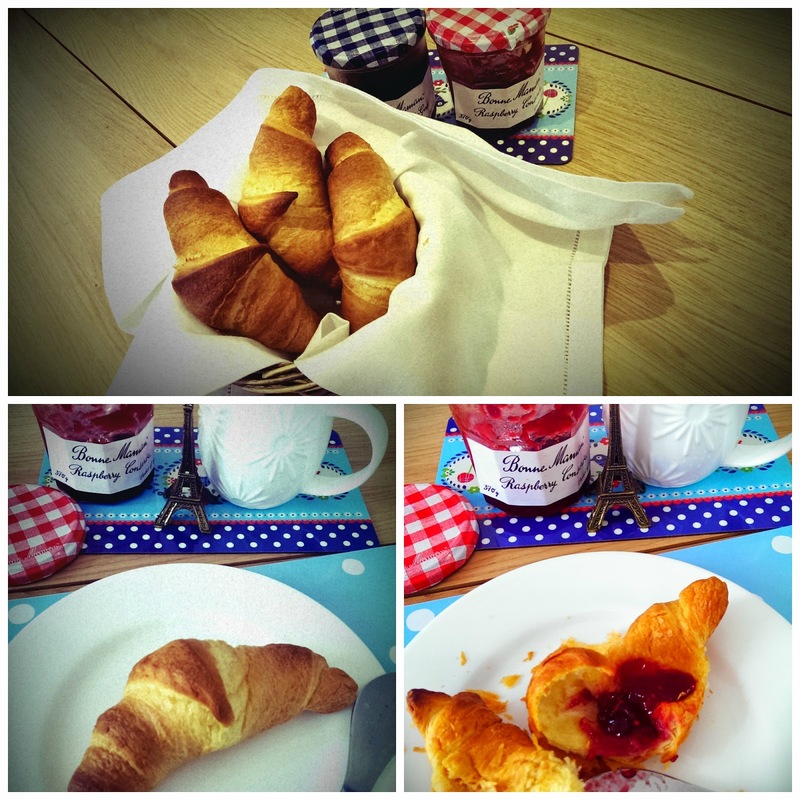 The following morning a suitably French breakfast was provided before we headed off into town to see the race. We decided that an uphill part of the route was probably the best place to see the action so we walked down the canal to Mytholmroyd and then up towards Cragg Vale, which is the longest continuous incline in England - a great spot to see the riders as they approached and then as they continued up the hill. 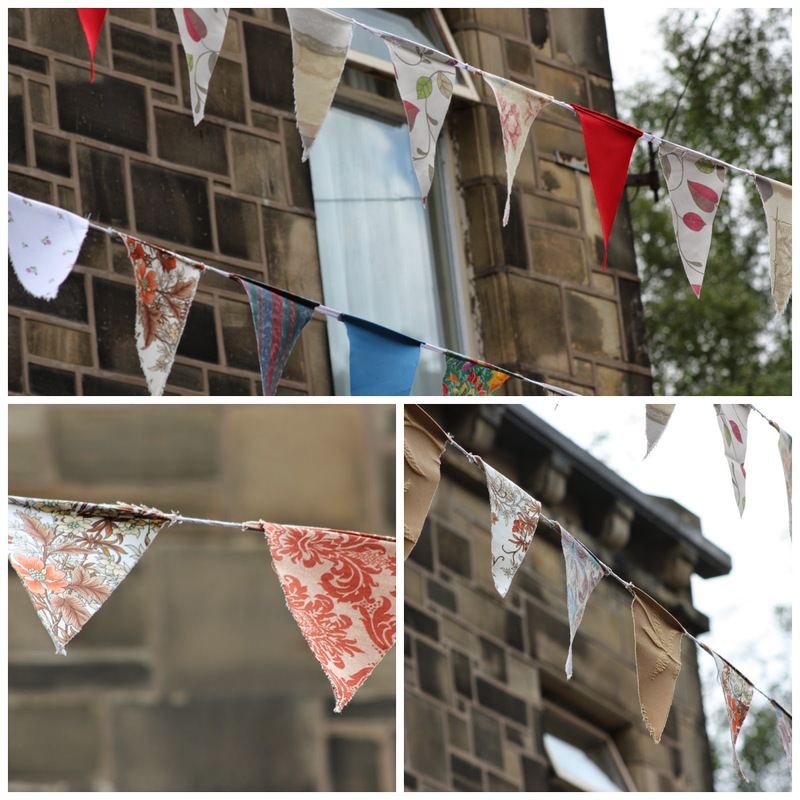 The villagers of Cragg Vale have recently broken the world record for the longest bunting and my, was there a lot of bunting. My favourite was this vintage fabric. 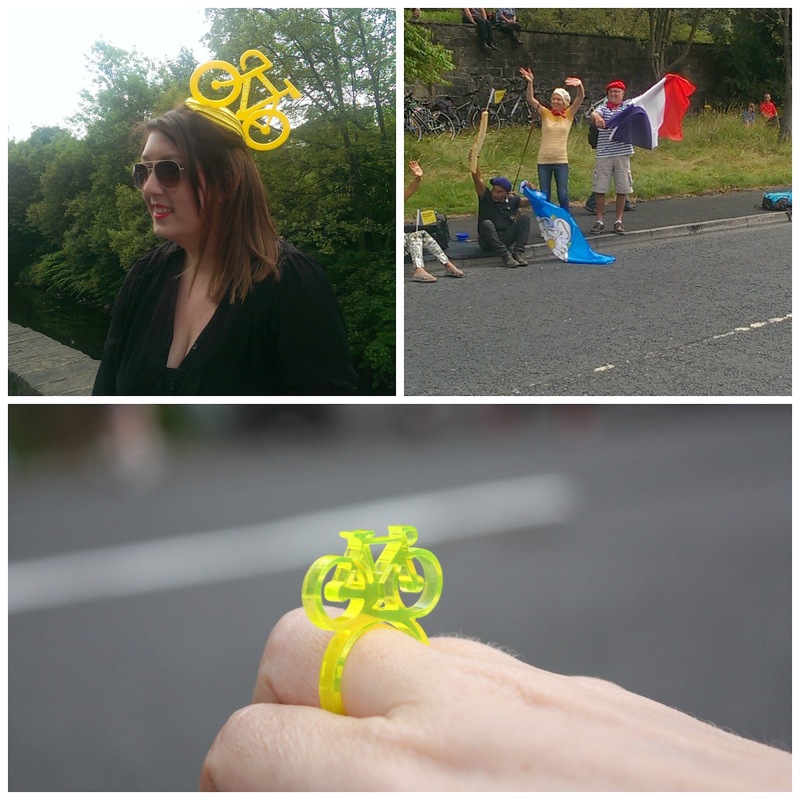 We were kitted out with our Le Tour rings* from Element in Hebden Bridge and yellow head bands (très elegant!!) and saw some other pretty fab outfits on our way. After a short wait we heard sirens and cheers from further down the hill and before we knew it the group leaders were whizzing by followed by the peloton. It was fantastic to be so close to the action! 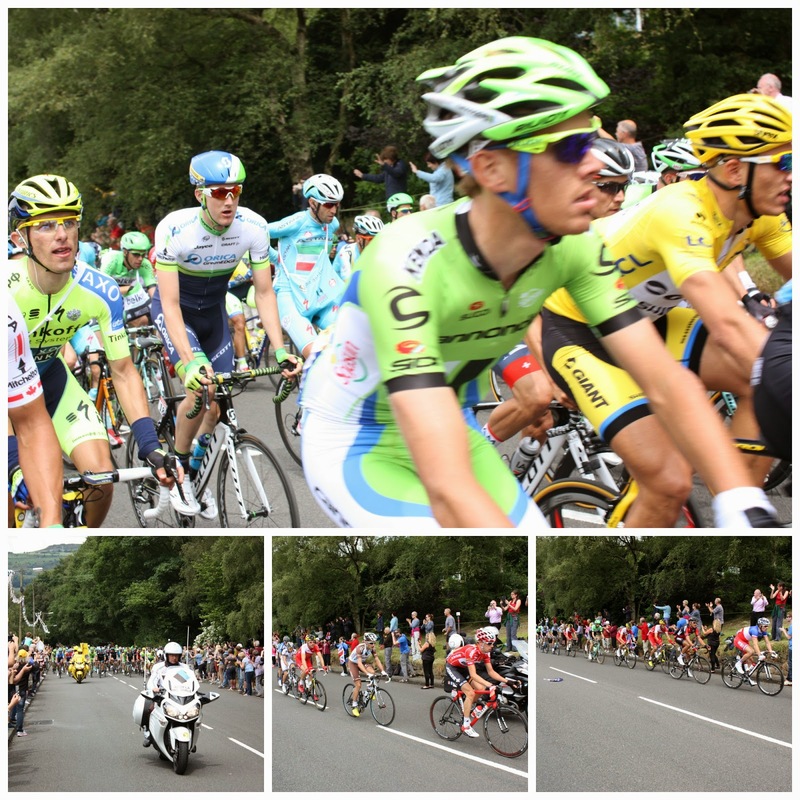 Well that's the last of my Tour de France/Yorkshire posts - I hope you've enjoyed them. I'm not really into sport but when such a big event happens so close to where you live you can't help but get caught up in the excitement! Did you get to see the race? Did you hold your own party? I'd love to hear what you got up to! Thank you to Philip Grace for being my official photographer after my battery ran out and to both Monsieur and Madame Grace for their company over the weekend! 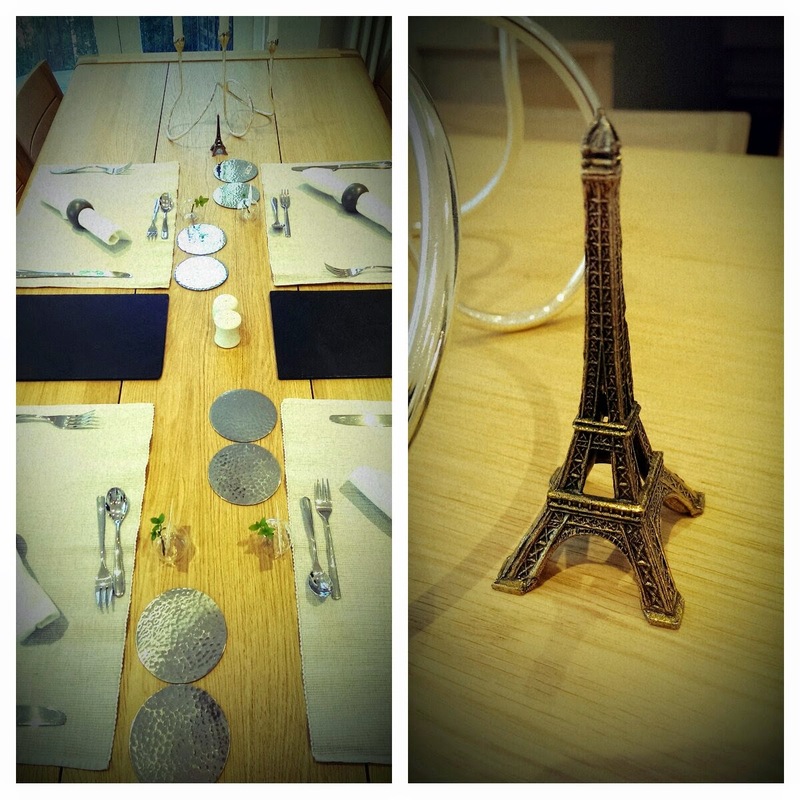 *Our Le Tour rings were kindly gifted to us by the lovely ladies at Element Jewellers in Hebden Bridge.